Aeroquip Stainless Steel Overbraid UNIVERSAL - Lightning Motorsports - Selling Speed since 1996 ! 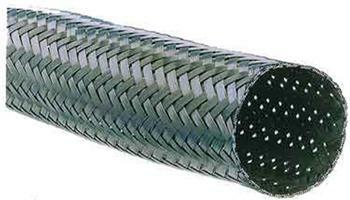 Stainless Steel Overbraid is used to dress up existing rubber hoses. Stainless Overbraid simply slips over current radiator hoses and can be clamped with the Aeroquip Performance Products PRO CLAMP™ connectors for a finished hose assembly look. Stainless Overbraid provides no additional performance for the hose. Stainless Overbraid does provide added abrasion resistance and good looks.